In this installment of Free Lesson Friday, instructor Wolf Marshall shows you how to jazz up the 12-bar blues form using a I-VI-ii-V turnaround. For more ways to "jazz your blues," check out his complete lesson Jazz Blues Progressions. The 1980 album, Hi Infidelity, was the ninth release from Champaign, Illinois, rockers REO Speedwagon, but it was by far their biggest—selling nearly 10 million copies since its release. It was also their first #1 album and contained their first #1 hit, "Keep on Loving You," which along with the album's second-biggest hit, "Take It on the Run," remain classic rock favorites to this day. Singer Kevin Cronin's velvety voice may have occupied the spotlight, but it was guitarist Gary Richrath's soaring solos that have turned these tracks timeless for fans and players of classic rock guitar. We've just posted newly transcribed, note-for-note guitar tab for both of these smash hits. One of the most satisfying achievements for beginner guitarists is being able to strum chords well enough to start playing songs. 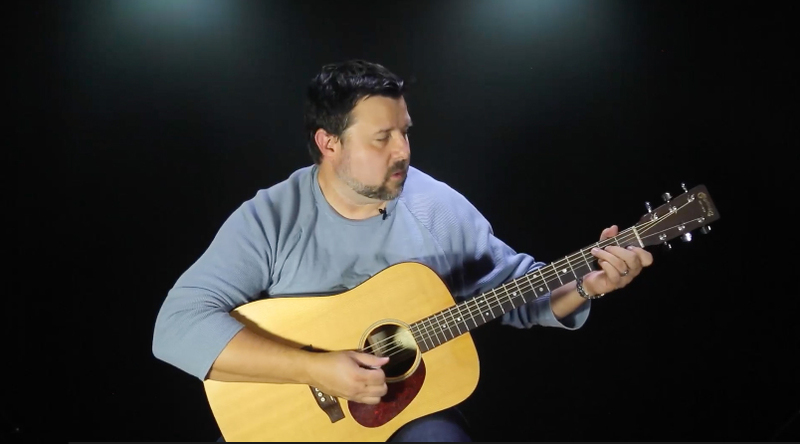 In a new 7-lesson series, guitar instructor and prolific Hal Leonard author Chad Johnson shows you just how to do that. Beginning with chords on just the top three strings and expanding out to full six-string chords, various rhythms, and essential strumming patterns, beginner guitarists will be well on their way to playing their favorite songs after completing these lessons. The 1964 lineup of the Paul Butterfield Blues Band was absolutely a blues supergroup, featuring Butterfield on harmonica and vocals, the Howlin' Wolf rhythm section of Jerome Arnold (bass) and Sam Lay (drums), and the great Elvin Bishop and Mike Bloomfield on guitars. The lead track from their 1965 debut album, "Born in Chicago" has become a blues standard and is presented here in our newest G-Plus Song lesson with step-by-step video instruction, guitar tab, and a play-along backing track. In this week's free lesson, you'll learn a fiery lick from one master of the Telecaster, Danny Gatton, from another master of the Telecaster, our very own Greg Koch. For more killer Tele licks, check out these lessons from Greg. Strum and Sing Along to the Best Songs From the Broadway Smash "Hamilton"
Admit it: you weren't really buying the notion of Hamilton, a hip-hop Broadway musical. But then, you heard a few of Lin-Manuel Miranda's infectious tracks, and next thing you know, you're singing along with King George on "You'll Be Back": "Da da da dat da, dat da da da day ya da." We're excited to bring you guitar chords and lyrics arrangements for 10 of the musical's most popular songs, for your strumming and singing pleasure. With our two brand-new G-Plus Song lessons from The Who, you'll be neither a sad man behind blue eyes nor crying in a teenage wasteland while trying to learn these tunes. Instructor Doug Boduch walks you step by step through all of guitarist Pete Townshend's iconic acoustic and electric guitar parts—perfect practice material for the weekend woodshed.